// Timeout for completing a call in seconds. This includes resolving DNS, connecting, writing the request body, server processing, and reading the response body. When the feature is activated, the field ContentRepository Type in the creation dialog has the new option Mesh ContentRepository. The field Url must contain a valid connection Url to an instance of Gentics Mesh. The Url must be in the format [protocol]://[hostname]:[port]/[cr_identifier]. It is recommended to use authentication with ApiToken instead, to prevent session timeouts in long publish runs. Gentics CMS will authenticate against Gentics Mesh with username/password filled into the fields Username and Password. If the field Username is left empty, the field Password must contain a valid API Token. Consult the documentation of Gentics Mesh about how an API Token can be generated. By setting the field Roles Objectproperty to an object property (e.g. object.meshroles) it is possible to assign the readPublished permission on published objects to selected roles in Gentics Mesh. The object property must at least have one part of type Select (multiple) or Select (single) using an initially empty datasource. The datasource will automatically be filled with the roles in Gentics Mesh with the Repair action on the ContentRepository. It is necessary to perform the Repair action on the ContentRepository, after the roles in Gentics Mesh have changed to synchronize them into the datasource. When the option “Project per Node” is not selected, all Nodes that are published into the ContentRepository will be published into a single Mesh project. The name of the project is the [cr_identifier] from the connection Url. The contents of every Node in GCMS will be published into a separate folder in Mesh (having the same name as the Node). When the option “Project per Node” is selected, every Node will be published into a separate Mesh project (having the same name as the Node). In this case, there will be no “root” folders in the Mesh projects, representing the Nodes, but all immediate children of the Nodes in the GCMS will be directly put into the roots of their respective Mesh projects. In order to publish a master node with its channels into the same Mesh ContentRepository, this option must be selected. See Multichannelling for details. By setting an implementation version, it is possible to let the publish process publish objects into separate Mesh branches. For details see Mesh ContentRepository Implementation Branches. The fields in the schemas are defined by the tagmap entries of the Mesh ContentRepository in the CMS. When a new Mesh ContentRepository is created, it will have some default tagmap entries. Some of them are Reserved and cannot be modified or removed, because they are absolutely necessary. For each object type, exactly one tagmap entry is marked as Segmentfield. The segmentfield is used to construct the URLs to objects in Gentics Mesh and must be unique among objects with the same parent folder. For folders, the default segmentfield is pub_dir, but for this to work as expected, the feature Publish Directory Segment must be activated for the node. For each object type, exactly one tagmap entry is used as Displayfield. The displayfield is used to represent the object in the Administration UI of Gentics Mesh and must be unique among objects with the same parent folder. 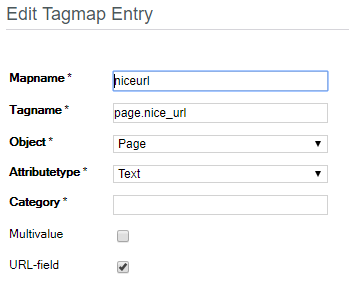 Tagmap entries can be marked as URL-field. By filling URL-fields, it is possible to specify additional URLs (besides the URL, which is constructed from the segment fields) for accessing objects, that are published into the Mesh ContentRepository. Tagmap entries of type “Micronode” will publish the editable data contained in tags into micronodes. It is possible to publish single tags (e.g. by using the tagname page.tags.content to publish the tag content) into a single value field of type Micronode. When using e.g. page.tags, the field must be multivalue and will contain all tags of the page as list of micronodes. If the field names of a microschema to be generated are not unique, creation of the microschema (and therefore the publish process) will fail. It is for instance not possible to create a microschema from a construct having a part of type URL (page) with keyword url when there is another part with keyword url_internal. All other part types will be mapped to a single field. For tagmap entries of type “Micronode”, it is possible to define a filter for the published micronodes. Only tags matching the filter will be published into the field. The filter can contain a list of construct keywords (separated by comma, whitespace or newline), and can be a whitelist (keywords are not prefixed) or a blacklist (keywords are prefixed with -). Objects that are written into Gentics Mesh will automatically be put into a search index. To implement specific search features (like autocompletion, did-you-mean, …) it is necessary to extend the default configuration. This can be done by adding index specific configuration to the ContentRepository and to tagmap entries. The ContentRepository Searchindex Configuration can be set in the ContentRepository properties dialog in JSON format. The root-object can have attributes page, folder and file which contain the searchindex configuration for pages, folders and files. Every tagmap entry can have a specific searchindex configuration set in its properties dialog in JSON format. For publishing a node and all its channels into the same Mesh ContentRepository, the option Project per Node must be activated for the ContentRepository. The master node and its channels will be published into the same Mesh project, but every node/channel into its own Mesh Branch. The names of the Branches are the names of the node/channel (with spaces replaced by underscores). If an Implementation version is set, the branch names will be composed of the node/channel name and the implementation version. The properties dialog of Nodes in the CMS have a field Mesh Preview URL which can contain the URL to an application (portal) that is used to render the objects published into Gentics Mesh. When the URL is set and a page must be rendered in the CMS (for preview or in edit mode), the CMS will transform the page into a Mesh Node and POST that to the preview URL. The response is then used as template for rendering the page in edit or preview mode.